Research by Professor Sonia Rocha and her team at the Institute of Integrative Biology reveals new insights into how cells respond to oxygen deprivation. “Understanding how cells sense and respond to low oxygen is key to prevent damage and improve outcomes for patients. In addition, it also addresses a fundamental question in biology on how oxygen is utilised in cells,” explains Professor Rocha. The team wanted to improve this understanding, with a specific focus on identifying the fastest processes initiated by cells when faced with oxygen deprivation. 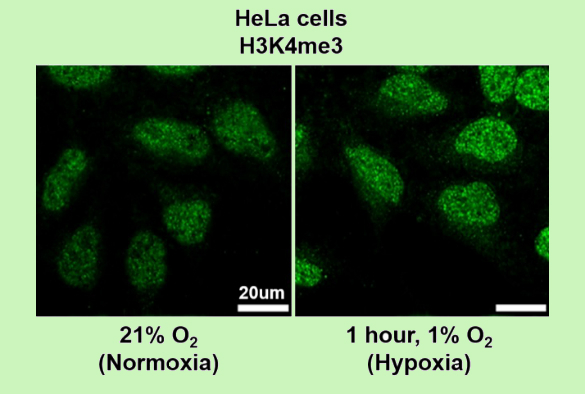 Previous work had focused on the activation of ‘hypoxia-inducible factors’ (HIFs) - transcription factors that respond to decreases in available oxygen and which are capable of activating hundreds of genes. However, it is also known that these responses take several hours to be mounted. To investigate faster processes, the team looked for specific molecular changes following short periods of hypoxia in human cells. They identified that chromatin quickly changes in response to low oxygen and that these changes are necessary for the cell’s response to low oxygen several hours later. They went on to show that the mechanism by which chromatin changes is via the inhibition of a class of enzymes that require oxygen for their activity. These completely unexpected findings, demonstrate for the first time that changes to chromatin preceed activation of gene expression in response to lowering of oxygen. Funding support for the work was received from Cancer Research UK, Wellcome Trust, Medical Research Council, Tenovus Scotland and the University of Liverpool. The paper ‘Hypoxia induces rapid changes to histone methylation and reprograms chromatin’ is published in Science [DOI:10.1126/science.aau5870].